The Grand Theatre in London, Ontario probably opened early in the 20th century as a vaudeville theatre. It is listed as open in the 1941 edition of Film Daily Yearbook, but in the 1943 edition of FDY it is listed as (Closed), but later re-opened. It closed as a movie theatre in 1965. It now operates as a live theatre with a seating capacity of 839. The Grand Theatre has had an entire book written about it, “Let’s go to the Grand!,” by Sheila M. F. Johnston. 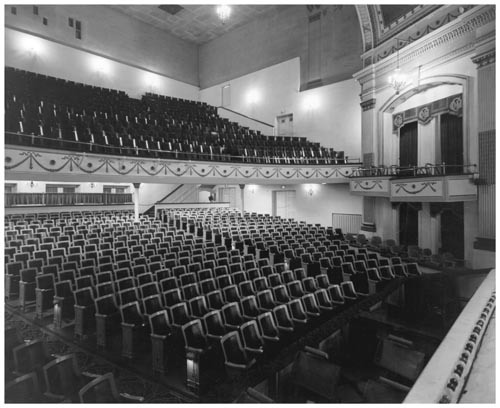 The Grand Theatre was originally designed by Chicago architect J. M. Wood. James Wood was one of the most prolific American theater architects of the late 19th and early 20th centuries. The restored mural on the proscenium arch is by Canadian artist Frederick Challener. The arch, side boxes, and the stage are virtually all that remains of Wood’s original design, the remainder of the building having been completely rebuilt in 1978.